Our practice is problem solving, our passion is planning, and our goal is your peace of mind. Kevin B. O'Donnell is an Associate Attorney at Carrell Blanton Ferris & Associates, PLC. His primary areas of focus are estate planning, estate administration and elder law. 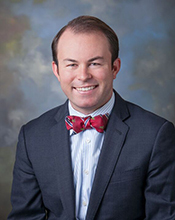 Kevin graduated from University of Richmond School of Law and has been an active member of the Virginia Bar since 2013. Prior to law school, he received his undergraduate degree from Queens University of Charlotte where he was also a member of the men's varsity soccer team. Prior to joining Carrell Blanton Ferris & Associates, Kevin was an attorney at Old Towne Lawyers, LLP in Petersburg, Virginia where he developed an interest in estate planning and administration. Kevin assists clients in creating estate plans to meet his client's individual goals, including planning for incapacity, transferring wealth, and asset protection.